Ambre Fetiche is from the Les Orientalistes collection. It is a gorgeous blend of amber with notes of frankincense, labdanum and styrax on a slightly sweet and warm base of benzoin. Ambre Fetiche is a luxurious and very long lasting fragrance. Its a Posh Peasant favorite. Ce Soir ou Jamais translates roughly to "Tonight or Never" in English. This is a lush rose scent. It's very natural and realistic, smelling a bit like tea rose initially then dries down to a bed of velvety rose petals. For fans of this sort of rose fragrance, Ce Soir ou Jamais is a must. Annick Goutal Duel features notes of of wild orange, absinthe, heather, Paraguay seed, absolu maté tea leaves, iris root, leather, tobacco, musk. Duel has a wonderful black tea note. this is the eau de toilette, edt. The power of citrus: essences of Sicilian lemon, light citron, tangerine, and juicy grapefruit. Fruits ripened by the Italian sun... it is a fresh combination that sparks the senses. Made of pure essences that freely diffuse their sweet aromas. Eau d'Hadrien is one of the best citrus scents in our opinion. A delicious childhood fragrance evoking the scent of honeysuckle and dewy grass, literally overflowing with tenderness, this perfume features ivy, privet, honeysuckle, and seringa, which blend together in nature's true embrace. Eau du Fier is a blend of tar, smoke and fruity sweetness. Tar is the main note of the composition blended with smokey tea and leather and topped with a citrus start. Eau de Fier is a unique and interesting fragrance. Notes include: bitter orange, osmanthus, salt flower, clove, tea, and birch tar. Eau de Fier is an eau de toilette and not available in the United States. Eau de Lavande is a classic aromatic lavender fragrance blending wild lavender from Grasse with a touch of tonka bean and vanilla. Eau de Lavande is an eau de toilette / edt and is unavailable in the United States. Eau du Ciel translates to Water of Heaven in English. The fragrance is an airy, fresh, soft and natural scent, utterly perfect for the hot summer months. Annick Goutal's Eau du Sud is a gift for lover's of citrus or for those needing something refreshing in a warm climate. Eau de Sud is most prominently about bergamot and grapefruit but upon dry down it has a teensy tendency toward some woody and smoky notes. We carry both the edt and edp – this is the eau de parfum. Encens Flamboyant is part of the 'Les Orientalistes' collection alongside Ambre Fetiche, Myrrhe Ardente and Musc Nomade. Composed of frankincense essence and resinoid, “vieille église” frankincense, black and pink pepper, cardamom, nutmeg, fir balsam, and mastic. Encens Flamboyant is an incense, smoky, frankincense, balsam fir dream. It is not sweet but very refreshing in as spicy resinous incense fragrances generally are. The balsam fir note emerges after an hour and asserts itself. All four fragrances from the Les Orientalist collection are edp – eau de parfum concentration and have good longevity. Folavril is among Annick Goutal’s first perfume offerings in 1981. Even though Folavril contains mango, a fruity note, it’s best categorized as a fresh floral instead of a fruity floral. Folavril is a Posh Peasant favorite and is simply sublime in the heat. The tomato leaf note is wonderful. The dry down becomes very clean and soapy, so be aware of that if you dislike soapy notes. Notes: mango, jasmine, boronia flower and tomato leaf. An intoxicating gardenia & tuberose perfume. A warm, heady, swoon-worthy floral. Heure Exquise (translates to 'Exceptional Hour' in English, which in this case is a reference to twilight or dusk, similar to L'Heure Bleue by Guerlain). Heure Exquise is a beautiful and graceful floral created by Isabelle Doyenne together with the late great Annick Goutal herself in 1984. Feminine as are most Goutal creations, Heure Exquise stands apart from the rest of the collection thanks to its exquisite Florentine iris heart note. The iris in the fragrance is supported but not at all overwhelmed by Turkish rose and Mysore sandalwood. There are some who compare Heure Exquise to Chanel No. 19. There is a galbanum/green note especially at the start and an overall cool orris/iris powdery quality to the fragrance. However, once Heure Exquise dries down it becomes much more soft, easy-going and floral than No. 19 which can seem stark and austere in comparison. 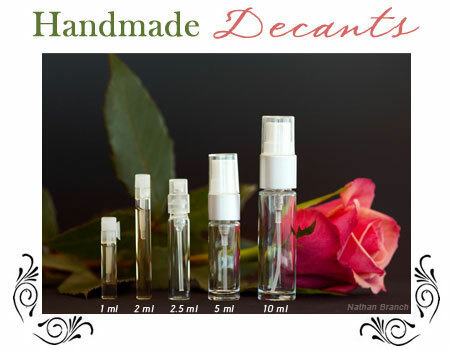 This is the eau de parfum / edp concentration -- unavailable outside of Europe. La Violette is a beautiful, delicate, slightly woody and green violet perfume from Annick Goutal. The flower, stem and leaf are used to make this sublimely green floral fragrance. With its delicate touch of rose, the violet is powerfully seductive. Annick Goutal Le Jasmin is a fresh, delicate jasmine. Launched for Spring 2011, Le Mimosa is an addition to Annick Goutal's Les Soliflores collection. Created by Isabelle Doyen, Le Muguet is part of Annick Goutal's Les Soliflores collection. Le Muguet is a study of the delicate beauty of lily of the valley. Le Muguet is an eau de toilette / edt. As the luminous light of the day turns to the sorcery of the night, this perfume evokes the woody and spicy notes of Tuscany when the night, touched by the remnants of a sunny day, finally comes to rest. A refreshing fragrance with orange notes gently spiced with cumin, sandalwood, vanilla, amber, and patchouli. Mandagore Pourpre is a flanker to the original Mandragore fragrance from 2005 both created by Isabelle Doyen. Pourpre is darker, spicier and more unusual than the original, but it is not just a more potent version, it's also it's own fragrance. The focus, given the name "mandragore" is the mandrake plant. Notes: bergamot, mint, star anise, amber, rosemary, geranium, black pepper, patchouli, myrtle, incense and heliotrope. Concentration: eau de toilette, edt. Annick Goutal Mon Parfum Cherie, par Camille is a glorious and glamorous fragrance. It is considered a chypre with notes of iris, violet, plum and patchouli. Musc Nomade is the fourth fragrance in the Les Orientalistes collection. It was created by Isabelle Doyen and Camille Goutal. Notes: white musks (muscone, angelica, ambrette), tonka bean with almond accents, labdanum, and Bombay wood. Musc Nomade is a softly singing musk. This is an eau de parfum (edp). Myrrhe Ardente is a meditation on myrrh. It is a beautifully resinous and intoxicating scent that envelopes your skin in the magic of myrrh. In addition to myrrh, this fragrances has notes of benzoin, vanilla tonka pods, gaiac wood and honeyed pure beeswax extract. Like a breeze that passes through an orange grove, this perfume will envelop your entire body; at its base, the distilled essence, warm and floral, of the orange blossom, with a touch of petit grain as well as green fruits to give a touch of freshness. Woody notes add a different touch to this scent, making it unique and different. Annick Goutal Neroli is a Posh Peasant favorite. Ninfeo Mio was created by Isabelle Doyen and launched in 2010. Ninfeo Mio is an eau de toilette / edt. Annick Goutal Nuit Etoilee launched in Spring 2012. Nuit Etoilee is was jointly created by Camille Goutal and Isabelle Doyen. It is described as a nighttime escapade amidst pristine, wide-open fields with forest and waterfalls. Notes include: citron, sweet orange, peppermint oil, angelica, wild Siberian Pine needles and Balsam fir. Created in 1983, Passion has notes of tuberose, jasmine, ylang-ylang, vanilla, patchouli and oakmoss. Passion is a heady white floral that is warm and easily worn. Of all the floral fragrances from Annick Goutal, we tend to think of Passion as the one created for the perfumista for the fragrance connoisseur. The sweet, fruity notes of peach and pear mixed with the flowery touches of rose musk on a vanilla base. All the naïve and determined "Child Woman" will be seduced by this Eau de Parfum, with intense feminine chords of fresh roses. The impertinence of the peony is translated here by the triumphant strike of wild roses and pink geranium, associated with slightly acidic yet savory aromas of red currant, pomegranate, cherries, and peaches. This sparkling, joyful mix found here in an Eau de Toilette... is to be appreciated like a glass of Champagne Rosé ! Annick Goutal Rose Absolue is an absolutely gorgeous deep red rose soliflore. It is said to blend together the rarest roses found in the world; Bulgarian, Turkish, Damask, May, Egyptian and Moroccan. Rose Absolue is not sharp or strident yet someone manages to be perfectly crisp, fresh, realistic and stunning. Rose Absolue is an eau de parfum / edp.